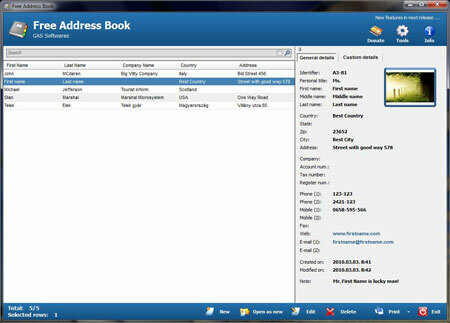 Free Address Book is a Portable Freeware Personal Information Manager that can be used to help you organize your contacts. Store addresses, phone numbers, fax numbers, company names, country, city, state, website addresses, and email addresses of your associates and contacts. Account numbers, Tax numbers and registration numbers can also be stored for business clients or employees. Custom fields can easily be created as well. The resulting Address Book entries can be searched using the tool and even printed.